The foundation presented the university with a check during the Jan. 27 Ole Miss men’s basketball game against Auburn. The money will help fund programs through RebelWell, which offers a wide range of opportunities to become educated about living a healthy lifestyle and also offers group fitness classes, cooking demonstrations and nutrition counseling, among other services. The grant positions the university to continue its work and also achieve its wellness goals, said Andrea M. Jekabsons, UM assistant director of employment, development and engagement who serves as the project lead with RebelWell. 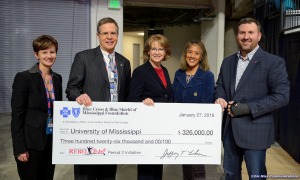 The Blue Cross & Blue Shield of Mississippi Foundation awarded the University of Mississippi $326,000 for new health and wellness programs on campus that extends into the local schools and communities. In 2015, UM was named one of Mississippi’s Healthiest Workplaces for 2015 by the Mississippi Business Journal, the Mississippi Business Group on Health and the Mississippi Department of Health. The American Heart Association has also consistently recognized UM as a “Fit Friendly” employer either at the gold or platinum level since 2009. Campus health programs had benefited from a $250,000 wellness grant from the foundation in 2014. The latest award from the foundation brings the total to $575,000. Grant funds will be used for nutrition educational expenses and to buy physical activity equipment and supplies. Some of the money also will help buy educational equipment for school-age children and promotional items and funding for campaigns, contracted services, community programs and sponsorships for major events. There’s also funding for fresh fruit for school programs and a national certification for a strength program aimed at women over 40. RebelWell will offer nutrition education through counseling sessions, seminars and demonstrations and also execute programs to highlight local wellness role models. Promotional materials will be produced co-branded with RebelWell and Blue Cross & Blue Shield of Mississippi Foundation logos. Those items will serve as reminders for wellness habits and healthy choices, promotion of physical fitness opportunities and scheduled events, fairs, screenings and challenges both on and off campus. One new development is that the Mayor’s Council for Wellness and the RebelWell Community Advisory Board will merge. The projects will continue to be promoted on the RebelWell Web page and also on social media. Brandi Hephner LaBanc, UM vice chancellor for student affairs, has been appointed to oversee the program with the assistance of two project leads. Hephner LaBanc will work with the RebelWell committee, which has members from a diverse group of campus, community and school representatives. The committee consists of four subcommittees: physical activity, nutrition, general well-being (balance) and communications. Each subcommittee is charged with carrying out at least three wellness initiatives or programs. “Blue Cross & Blue Shield of Mississippi Foundation has given the LOU community a wonderful gift: the gift of wellness,” Hephner LaBanc said. “I am proud to work alongside my colleagues to envision, design and implement engaging programs and outreach initiatives that benefit us all. UM continues to make strides in creating a wellness culture on campus and in the local community, Jekabsons said. The Blue Cross & Blue Shield of Mississippi Foundation works to build a healthy Mississippi through targeted grant making throughout the state, focusing on health and wellness initiatives to support our schools, communities, colleges and universities. More information is available athttp://www.healthiermissisippi.org/.